The NFL Draft runs Thursday through Saturday. Here’s the picks in the first round. Analysis: The most NFL-ready quarterback in the draft, although character issues remain. Analysis: Heisman winner set Pac-12 conference record for most touchdowns in a single season with 58 — 42 passing, 15 running, 1 receiving. Analysis: Fowler had 14½ sacks in three seasons at Florida, proving to be one of the most disruptive edge rushers in the Southeastern Conference. Analysis: Considered one of the most polished prospects in the draft and immediately will become the top receiver on the Raiders. He led the nation with 124 catches last season in the tough SEC and ranked second with 1,727 yards receiving and 16 touchdown catches. 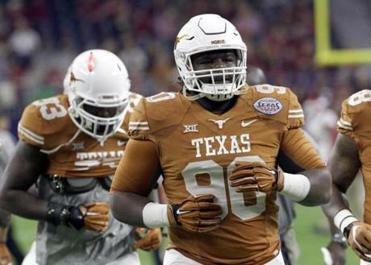 Brown, who is 6 feet 2 inches, 319 pounds, was a first-team All-American last season at Texas. Analysis: Choice addresses one of Washington’s many needs — improving the right side of the Redskins’ offensive line to protect QB Robert Griffin III. Scherff is 6-foot-5 and about 320 pounds. Analysis: Williams, who had 20 sacks in three seasons with the Trojans, adds to new coach Todd Bowles’ already solid defensive line that includes fellow first-rounders Muhammad Wilkerson and Sheldon Richardson. Analysis: A play-making receiver who can replace the traded Brandon Marshall. White, a junior college transfer, made a big impact in two seasons at West Virginia and had a particularly strong senior season, finishing third in the nation with 109 receptions and sixth in yards receiving with 1,447. Analysis: Addresses a glaring need on a struggling defense. Beasley was regarded as perhaps the most explosive edge rusher in the draft. Analysis: Flowers is a huge, nasty player who excels in in pass protection, something bound to give Eli Manning more time to throw to Odell Beckham Jr. and Victor Cruz. Analysis: Provides backfield help for new quarterback Nick Foles. Gurley is coming off knee surgery last November after being suspended for four games earlier in the season for a violation of NCAA rules. Analysis: The 6-foot, 186-pound Waynes left the Spartans after becoming a first team All-Big Ten selection in his junior season. Had eight pass break-ups and three interceptions, one of several NFL prospects on a Michigan State defense that was one of the best in the country throughout his career there. Analysis: The 6-foot-2, 339-pound Shelton should help a defense that ranked last in the NFL against the run in 2014. Analysis: The 6-foot-7, 316-pound Peat, could compete for playing time at either guard or tackle. Analysis: Parker missed the first seven games of his senior season with a foot injury, and then caught 43 passes for 855 yards and five touchdowns in the final six games. He tied the Louisville record for career touchdown receptions with 33, and had 10 100-yard games. Parker dropped just three passes in his final three seasons of college. Analysis: The Chargers needed a bruising back to help take the pressure off Rivers, and got it in Gordon. He set the FBS record for career rushing average with 7.79 yards per carry. Analysis: Johnson had 43 tackles, including 3 ½ for losses, defended 15 passes and had three interceptions as a senior last season. The 6-foot Johnson joins a secondary that features cornerbacks Kareem Jackson and Johnathan Joseph. Analysis: The 49ers added a big body — 6-foot-7, 292 pounds — with a quick first burst off the line. Analysis: Chiefs are taking a chance on a player kicked off the team at Washington in an attempt to help their defense in the pass-happy AFC West. The physical Peters was considered one of the top defensive backs in the draft, but he gave many teams pause after his dismissal last November. Analysis: Erving adds depth to Cleveland’s offensive line, and he could be a long-term backup plan at center if Pro Bowler Alex Mack decides to opt out of his contract after next season. Analysis: The 6-foot-1, 190-pound wideout helps replace Pro Bowl receiver Jeremy Maclin, who departed in free agency. Analysis: The Bengals took a bit of a risk because Ogbuehi is coming off reconstructive knee surgery. Cincinnati doesn’t need a draft pick to come in and start right away, so they’re looking for players who will add depth for now and grow into a bigger role next year. Analysis: Dupree had 23 1/2 sacks in his career with the Wildcats. The Steelers are badly in need of help along the edge after finishing 26th in the league in sacks in 2014. Pittsburgh has now taken an outside linebacker in the first round each of the last three seasons. Analysis: Ray was considered a top-15 talent but slipped down the draft board after he was issued a misdemeanor citation Monday morning when a police officer found a small amount of marijuana in his car. Analysis: The 6-foot-5, 307-pound Humphries could slide in to the right tackle spot, where Bobby Massie struggled at times last season. Analysis: The 6-foot, 228-pound Thompson was the winner of the Paul Hornung Award, given to the nation’s most versatile player. He scored six touchdowns in 2014 — four on defense and two as a running back. He even started at tailback against Colorado last year and ran for 174 yards and a touchdown on 15 carries and caught two passes for 41 yards. Analysis: Perriman caught 50 passes and averaged 21 yards per reception as a junior last season. The 6-foot-2, 212-pounder fills a huge void for the Ravens, who had taken a defensive player with their top pick in each of the past five years. Analysis: Jones played the first seven games of last season before a lingering shoulder injury sidelined him for the rest of the year. He had eight career interceptions at UConn. Analysis: Tomlinson was a first-team All-American as a senior. Tomlinson also received the 2014 Orange Bowl-FWAA Courage Award. He grew up in Jamaica and came to the U.S. when he was 10, growing 7 inches and gaining about 80 pounds in his first year in the country. Analysis: Last season, Dorsett caught 36 passes for 817 yards and had 10 touchdown receptions and was twice clocked under 4.3 seconds in the 40-yard dash. By taking the speedy Dorsett, the Colts have added another weapon to their increasingly impressive receiving corps. Analysis: The 5-foot-11 Randall played safety at Arizona State, but the Packers might be looking at him as a cornerback after veteran Tramon Williams left for Cleveland and Davon House left for Jacksonville. Analysis: The 6-foot-3, 245-pound Anthony joins a Saints defense that ranked second-to-last in the NFL with 384 yards allowed per game. Last season, he led Clemson was 90 tackles, and was named first-team All-ACC. Analysis: Position became a priority when Vince Wilfork, a five-time Pro Bowler, signed with the Houston Texans after spending all 11 of his NFL seasons with the Patriots. At 6-feet-2 and 319 pounds, Brown is similar in size to Wilfork and started every game the past two seasons.